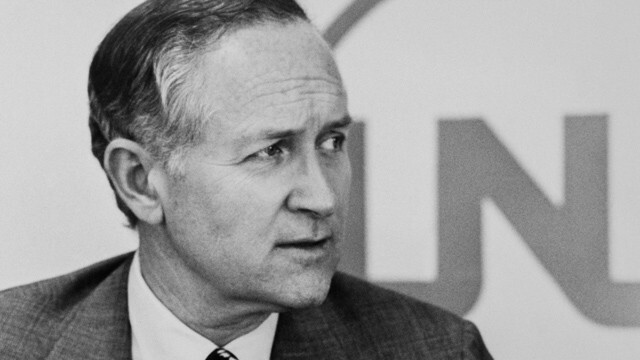 It is with great sadness that the United Nations University announces the death of Dr. James McNaughton Hester, UNU’s first Rector (1975–1980). Dr. Hester passed away at his home in Princeton, New Jersey, on 31 December 2014, aged 90. The appointment of Dr. Hester as the first Rector of UNU was announced by UN Secretary-General Kurt Waldheim on 22 November 1974. During his five-year term as UNU Rector, Dr. Hester tackled the challenge that, in his words, “simultaneously we had to invent, fund, implement, popularize and justify the University”. He later described the experience as a “grand adventure”. Dr. Hester was appointed Rector of UNU after serving 14 years as President of New York University (NYU), where he earned an international reputation for the role he played in strengthening NYU and as a leading spokesman for higher education. He had joined NYU in 1960 as Executive Dean of Arts and Science and Dean of the Graduate School of Arts and Science. Committed to the concept of the urban university as an agency for the intellectual, cultural, professional and economic progress of the city, he maintained that “the world needs men and women who combine appreciation of their cultural heritage and knowledge of the challenge of urban civilization”. Dr. Hester was born on 19 April 1924, in Chester, Pennsylvania. He spent his boyhood at various stations to which his father, a United States Navy Chaplain, was assigned, including Hawaii and Samoa. In 1942, he graduated from Woodrow Wilson High School in Long Beach, California. He attended Princeton University, where he won honours in the humanities and election to Phi Beta Kappa; he was awarded an AB degree in 1945. After joining the Marine Corps’ officer candidate programme, he was trained to be a Japanese language officer and subsequently served in Japan as civil information and education officer on the Fukuoka Military Government Team. In 1947, he entered Pembroke College, Oxford University, as a Rhodes Scholar, earning a bachelor’s degree in philosophy, politics and economics. Upon his return to the United States in 1950, he became assistant to the American Secretary to the Rhodes Trustees. Recalled to active duty with the Marines in 1951, he served 17 months as a battalion adjutant and instructor at Quantico, Virginia. After leaving the military, he spent several months at the National Archives in Washington, DC, doing research for his doctoral thesis. He received a D. Phil. degree from Oxford University in 1955. After gaining business experience in management consultation and consumer research, he returned to academic life in 1957 as Provost (administrative and academic head) of the Brooklyn Center of Long Island University (New York) and, subsequently, Vice President of Long Island University. In 1960, he became Dean of both the undergraduate and graduate schools of arts and science at NYU, becoming President of the University in 1962, at the age of 37. Dr. Hester served as chairman of the President’s Task Force on Priorities in Higher Education in the United States (1969). He also served as President and a member of the executive committee of the Association of Colleges and Universities of the State of New York, and as President and a member of the board of trustees of its Commission on Independent Colleges. Upon leaving the UNU rectorship, Dr. Hester served as President of the New York Botanical Gardens (1980–1989) and as President of The Harry Frank Guggenheim Foundation in New York (1989–2004). In his later years, Dr. Hester became a professional portrait painter and had numerous showings of his work. He held honorary degrees from many leading universities and colleges, including an LHD awarded by NYU in 1977, and was a Chevalier of the French Legion of Honour. In 1981, the Emperor of Japan conferred upon Dr. Hester the First Class of the Order of the Sacred Treasure. Dr. Hester is survived by his wife; children Janet, Margaret and Martha; seven grandchildren; and a brother and sister. Contributions in honour of Dr. Hester may be made to Princeton University (Princeton, New Jersey) or to the Southern Poverty Law Center (400 Washington Avenue, Montgomery, Alabama 36104).